Pasta with Sausage, Sage, Avocado, Thyme for Cooking easy gourmet dinner. Not quite a pasta salad; not quite a hot main course. The fresh tomato 'sauce' is not cooked, nor is the celery, and the beans are at room temperature. If you can't get fresh sage use another fresh herb. Dried won't work in this dish. Grill sausages on barbecue or sauté in a skillet until done. Cut into 1" (2.5cm) lengths. Snip sage leaves in half or thirds. Cut the tomatoes in half. Cup half of a tomato in your hand and rub it on the big holes of a box (or other style) grater until all that is left in your hand is the skin. You'll have to press a bit, but not too hard, be careful not to grate your hand. Repeat with as many halves as you think you want/need. You end up with fresh tomato sauce with no skin... and no cooking. Depending on size of tomatoes you will want to do 3 or 4. 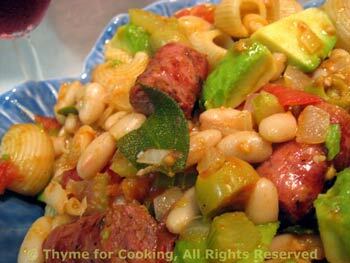 Put pasta, beans, celery and sausages into a large bowl, Add tomato sauce and toss to combine. Add avocado, olives and sage leaves, toss gently and serve.